Trndmrkr had the opportunity to go to Budapest to be a guest speaker at the Nike Central European event. 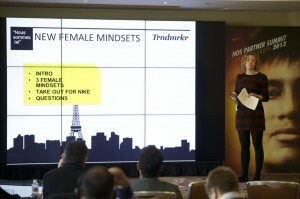 The presentation gave insight about the New Female Mindsets that I have researched in the recent year. In many ways the traffic lights have been on green for women globally, economically, socially and mentally. They have moved towards being more truly independent and ultimately this has an effect on how the world sees them, how they see themselves and what they want as consumers. During the presentation we went into how brands can recognize these changes and use this knowledge when dealing and communicating with (young) women.